Mayor Ravi Bhalla and Business Administrator Stephen Marks welcomed Hoboken’s newest firefighter Michael Ross at City Hall. Ross presented Chief Brian Crimmins with an American flag that was flown over his base in eastern Africa. (See Brief) Photo by Jerry Lore. The New Jersey Department of Transportation has awarded Hoboken $937,945 for transportation funding through the state’s 2019 Municipal Aid Program. This funding will be used by the city for various transportation projects including road repaving, the implementation of complete streets, and pedestrian safety upgrades related to Hoboken’s “Vision Zero” program, according to a press release from the city. The city has received nearly $2 million from the Municipal Aid Program over the past two years. The grass will be greener now that Hoboken began grass seeding in Church Square Park, Stevens Park, Elysian Park, and Harborside Park on Friday, April 5. Specific grass areas will be closed for a 3-week period, as well as the entire grass field at Harborside Park. Residents are encouraged to stay out of areas marked as closed, because foot traffic will prevent grass from growing. And remember, dogs are not allowed on grass in parks. The safety surface at Elysian Park will be replaced later this year, pending approval in the capital budget. 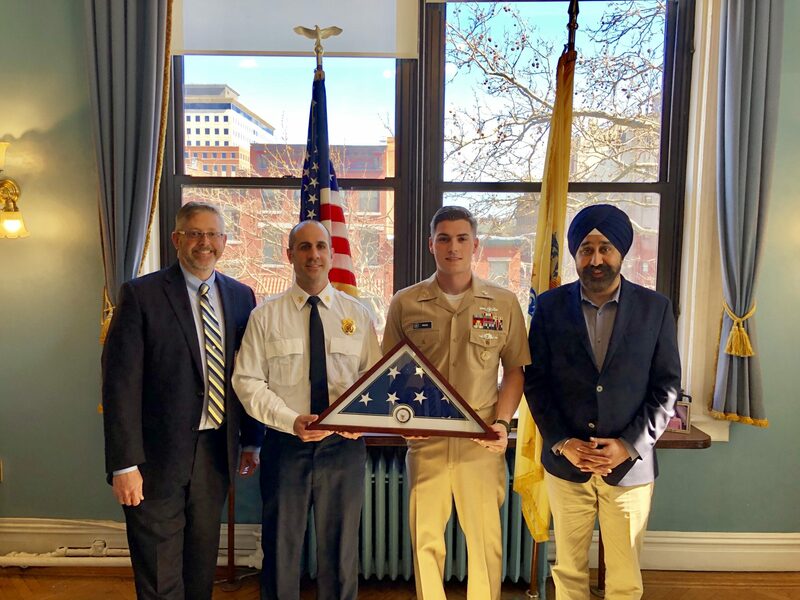 On Monday, April 1 Mayor Ravi Bhalla and Business Administrator Stephen Marks welcomed Hoboken’s newest firefighter Michael Ross at City Hall. Ross was appointed to the Hoboken Fire Department in February, 2018 but before he could begin training, Ross was deployed to eastern Africa with the United States Navy Reserves. During his 14-month deployment, Ross and his Task Force were awarded the Defense Meritorious Service Metal. Members of the community are invited to join Hoboken’s third annual Spring Fling, a community-wide day of service dedicated to cleaning up Hoboken parks and public spaces, on Saturday, May 4, from 10 a.m. to 2 p.m.
Hoboken residents, businesses, and community groups work together on this hands-on, high-visibility service project. For the first time this year, participants can register for the project that interests them most using VolunteerMatch. They can register as groups or individuals. By registering through VolunteerMatch, participants can learn about future volunteer opportunities with the city. Community cleanup projects may include mulching tree pits, planting, weeding, painting benches, railings, or other public areas, and removing debris from public property. More than 500 residents participated in 34 projects in the 2018 Spring Fling. To register and for more information, visit:www.hobokennj.gov/springfling. On Saturday, April 13 the Hoboken Public Library will host a lecture to teach attendees how they can protect themselves against identity and online theft. The session will be from 12 to 2 p.m. in the large programming room of the library on the corner of Fifth Street and Park Avenue. On Saturday, April 20, from 2 to 4 p.m., the Hoboken Public Library will host a jazz concert in Church Square Park. Dan O’Dea and Eagle Ridge, a New Jersey-based bluegrass band that plays a mix of classic and modern bluegrass, folk tunes, and rock with a bluegrass flavor, will be the central act of the library’s Gazebo Mic-Club Concert. Eagle Ridge is comprised of Dan O’Dea who plays fiddle, mandolin, and vocals; Bobby Baxmeyer on the banjo, dobro, and vocals; Austin Alfano on the upright bass; and Nick Conte on guitar and vocals. An open mic session will follow the professional band. All are welcome to participate. On April 25 at 7 p.m. John Bredin, host of the nonprofit TV show and Podcast “Public Voice Salon,” will host a town hall/dialogue to discuss how social media can heighten our sense of loneliness and disconnection. All are invited to share their concerns, questions, and even stories on why community matters today more than ever. After a brief introduction on why he feels this issue matters, Bredin will facilitate an open, exploratory dialogue. The event, which will not be filmed, is free and open to the public at Symposia Community Bookstore, 510 Washington St.
Space is limited, so please RSVP at johnbredintv@gmail.com. HBO and Red Cross invite “Game of Thrones” fans to Bleed #ForTheThrone. Those who donate by April 30 will be automatically entered for a chance to win a full-size Iron Throne from HBO’s Game of Thrones and receive a commemorative Bleed For the Throne poster while supplies lasts. Terms and conditions apply and are available at RedCrossBlood.org/HBOGameofThrones. The Hoboken Historical Museum at 1301 Hudson St. will have a blood drive on April 30 from 3 to 8 p.m.